This past year an eagle scout put up a bunch of new bat boxes at the nature center where I work. We're still waiting for the bats to discover them but there are bats aplenty on site. They find any small space on the side of the building to wedge into. We try to do all we can to encourage bats to take up residence on site as they do a great job eating mosquitoes and flies. With the great benefit they are in mind, I'm watching the white nose syndrome story closely as I would hate to lose our little flying mice. If you haven't heard about this awful problem facing bats read more. This strange disease is wiping out bat populations. Bats are an important part of our ecosystem and we need to conserve them. Putting up a bat house is a great way. The best designs are those from Bat Conservation International. I recommend a nursery box. 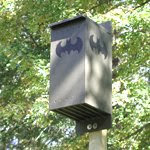 Single chamber roosting boxes are okay but won't really help beef up the bat population on your property. If you're a person prone to excess and you have the means, why not build your own bat cave?